The ibis Budget Saran is located in Saran, just 5 km away from Les Aubrais Train Station and Orléans city centre. Guests can enjoy free WiFi access and free private parking on site. 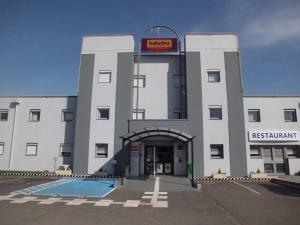 Rooms at ibis Budget Saran feature a flat-screen TV and an en suite bathroom which has a shower and free toiletries. A buffet breakfast is served every morning. Guests will find restaurants within 1 km of the hotel. A shopping centre and a bowling alley are 2 km away. Chambord is 59 km away from the hotel and Chartres is 70 km away. When would you like to stay at Ibis Budget Orléans Nord Saran ? Please note that if you reserve more than 7 rooms special conditions apply. Each day we'll check prices and send you an email for your selected dates at Ibis Budget Orléans Nord Saran. If you don't have specific dates but would like to check prices for say next weekend or say next month we can check the price too. Click to write a review and share your experience of Ibis Budget Orléans Nord Saran with other travellers.